Now you have. Meet Evan Davis. 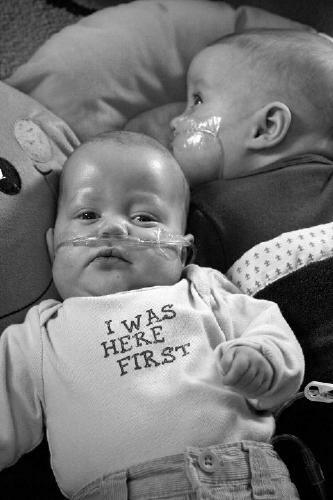 He and his brother Finn were born 16 weeks early, on August 1st, 2009. Evan essentially has only half a working heart. 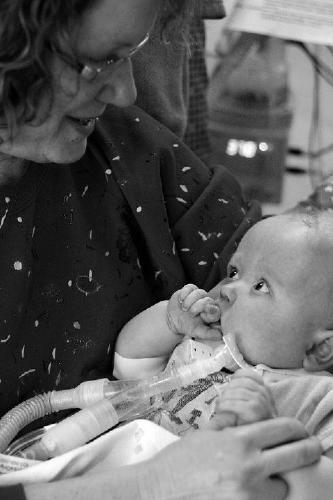 He was born with Hypoplastic Left Heart Syndrome. 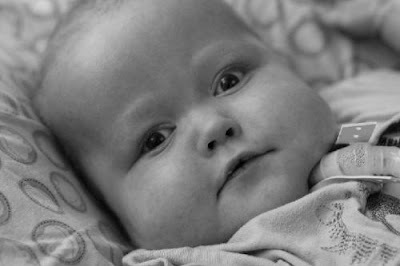 No baby has ever made it in the world born before 36 weeks gestation with HLHS. He's spends his days in hospitals, his nights being watched over by medical professionals, his parents, and as his mother would say, by God. He is waiting, ever patiently, for a heart. Every day he lives is another day he makes history. He is waiting for a heart, but the one he has spends every beat loving those around him, and being loved in return. 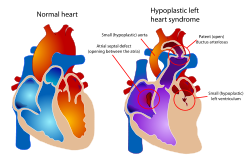 HLHS is a rare congenital heart defect in which the left side of the heart is severely underdeveloped. In babies with HLHS, the aorta and left ventricle are very small, and the aortic and mitral valves are either too small to allow sufficient blood flow or are atretic (closed) altogether. As blood returns from the lungs to the left atrium, it must pass through an atrial septal defect to the right side of the heart. 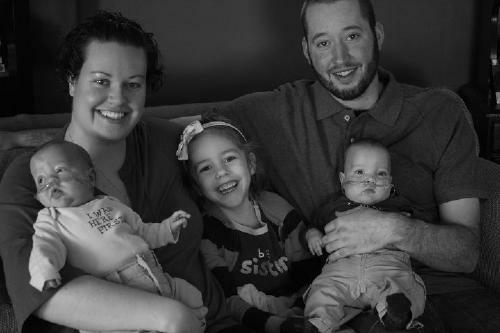 From the time he was born, Evan's family was told he would not survive. He's gone through more trials and traumas in his short life than most of us could ever fathom. Yet, each time the doctors told his mother that it would be the last time, little Evan came up fighting. Little Evan survived. I could go on and on about him, but, really, his mother does it best in her own words. "Rock bottom for me was the second day of life for the boys. I remember telling my mom - actually I think I dropped into her arms and sobbed, telling her I couldn't do this - I couldn't let Evan die. ... I promised to pray every day and to be thankful every day. To always remember what is at stake ... Soon days turned to months and although everyone still told us Evan was going to die we pushed along and that bond that we formed that feeling that everything was going to be alright grew stronger." "As I stand and hold Evan's hand, I feel helpless. There is nothing i can do but love him and be there for him ... did you know that I was told to pay attention to Finn because he was the baby whose diaper I would be changing, and did you know that they told me he wouldn't make it through labor? "Having a baby with a deadly heart condition having any sick kid (means you) have a different respect for things. You may want your kid to be a doctor or to play sports...I just want my kid happy. Every smile to me is him playing sports and graduating from Harvard." "As I have said before and told everyone that has kid - enjoy every minute every second because that is how I live my days. I know no matter what no matter how hard whatever the outcome...he will be loved and taken care of. We are so blessed and so lucky to have him right now. I would be happy to take care of him in a wheelchair - I will take care of him whatever way he needs...but if he is suppose to be with God, then that is okay. He is very lucky to be loved by so many people. Thank you God for yet another miracle. We are so blessed." Take a moment, readers, and think of your own kids. Kiss them and love them and hold them dear. For whether they are well or struggling for survival, each of our kids is a miracle. February is National Heart Month. Evan is waiting for his. Let's help him find it, together. For more information on Evan or ways you can help, please visit his CaringBridge site, and his Facebook Page. Click here for more informaion on HLHS. Don't forget to submit your pictures! And if you like this blog, please vote for it at Tales of an Unlikely Mother on Babble.com. We're number 15, just scroll down and click on the thumbs up! It's quick and easy to do! Thank you so much, Darlena. It's beautiful. Toddlers and Tiaras? No, Thanks.